What Is Going On In Syria, And Why Aren't We Doing Anything About It? Currently, there are many conflicts worldwide that are creating refugees. This influx of refugees is creating a refugee crisis. In war, many individuals become displaced and are forced out of their homes. One of the major refugee conflicts is occurring in Syria. 13.5 million individuals who reside in Syria are in need of humanitarian assistance, due to a war that began in 2011. 4.8 million of those individuals are refugees, and 1.6 million are displaced within Syria, including children. Generally speaking, a refugee can be described as an individual who was forced out of their home country and cannot return back home safely. These circumstances can have both a psychological and a physical effect on a persons health. With that in mind, when the war finally does end, the impact of the war could last them over the course a lifetime. While people are displaced from their homes for many reasons, individuals of Syrian descent were removed because of the civil war that has originated in Deraa, Syria. This war has been occurring for over five years and has taken the lives of a quarter of a million individuals. It is occurring between those who support Bashar al-Assad, the president of Syria, and those who do not, who are known as the rebels. The war originated because citizens wanted to protest the arrest of fifteen school children. The reason they were arrested was because they wrote anti-government sayings on the wall with the use of graffiti. Because this happened, citizens started to come together through peaceful protests, asking for the release of the children who were arrested, democracy, and more freedom. The government was angered by this, and responded by killing four of the protesters. The following day they shot at mourners, resulting in the death of another individual. Word of this spread throughout Syria, and citizens started to become shocked and angered which resulted in protests spread throughout other parts of the country. Not only is the war affecting politics, but it also has an effect on individuals and countries. Admittedly, it is affecting some countries and individuals worse than others. Refugee children are seemingly taking the brunt of this civil war. Not only will it last them, and many others a lifetime of psychological impact, but there is also a physical effect on individuals as well. The children that are affected by the Syrian Refugee Crisis, are at a higher risk of becoming malnourished, getting various types of illnesses, abuse, and exploited. In what world should this be allowed? Yes, the UNSC (United Nation Security Council) is not allowed to do anything because of The Treaty of Westaphila, but I think an exception needs to be made regarding Syria. I made a fool of myself while meeting the world's most controversial political commentator. At least he's used to it. Grand Canyon University security guards held back a sea of people as I walked through the gates and into the antelope gym. 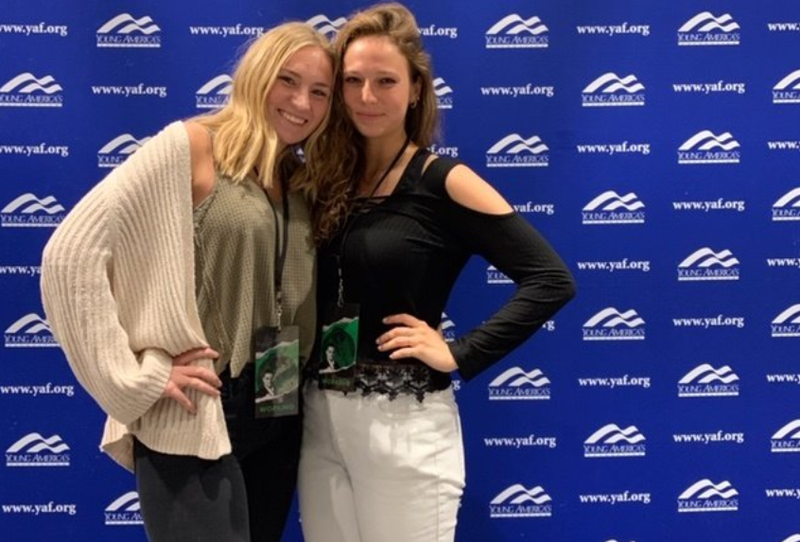 The "Shapiro ban" that had sparked outrage a few months before had just been lifted, and campus YAF (Young Americas Foundation) members were finally allowed to host the Daily Wire editor in chief. The only reason I was allowed access to this monumental event was because I'd pledged to help with the YAF club set-up about a week earlier. I was desperate to meet (and write about) Ben Shapiro. I received a name tag and was ushered into a room in the back of the antelope gym. I chatted nervously with another member of the YAF club as we waited for Shapiro to arrive. Finally, the 5'7" Kippah-sporting legend sauntered into the room. A smile was painted across his face as all of us (aspiring politicians and journalists) gawked at one of the most controversial figures to cross the political stage. Hating awkward silences, I "broke protocol" by walking up and introducing myself. We were supposed to fall into a photo line and keep comments/conversations to a minimum. I was quickly forced into line after shaking Ben's hand and briefly stating my name. "I want to be a conservative journalist, so I messaged you one of my articles on Facebook once." "I messaged you on Facebook once." I messaged you on Facebook once? I started to panic, knowing that the YAF leaders were in a huge hurry and I needed to get into the antelope gym so that I could start ushering students to their seats. So, instead of trying to elaborate, I stood there like an idiot with my mouth open and then walked away. I grabbed my phone from the girl who took my Shapiro picture and covered my face with my hands. Despite all of this, I tried to laugh off the situation and made the mistake of telling one of the YAF members about my blunder. He quickly added my quote to the YAF group chat on Facebook. I became an instant meme. Honestly, none of this really got to me since I was just happy to be in the same room as someone who could stump even the most intelligent political leaders. I forgot all about my embarrassing moment as I helped the leaders usher students to the right seats. Finally, the event started, and I took my seat to the right of the stage. After listening to his brilliant speech on "why we need both faith and reason," I felt prompted to ask him a question during the Q&A; time at the end of the event. I fell into (yet another) line with what I suspected was about 35 guys and one other girl student. 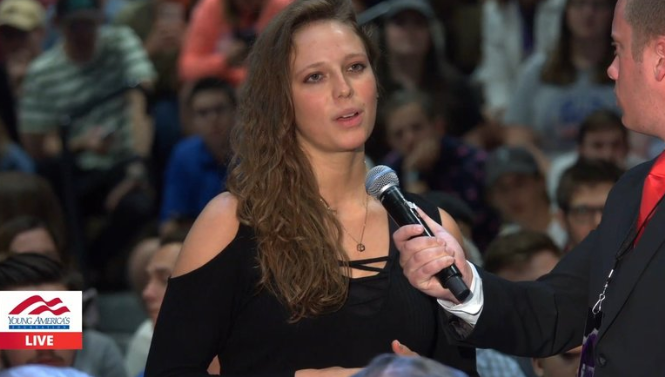 Standing in front of thousands of people was not my favorite thing to do, so I shifted my weight nervously and found it extremely difficult to focus on or remember any of the other questions that were asked. There were about 10 people still in front of me when I noticed all of the whisperings from the chief organizer of the event. They were about to cut off people off and end the event. I prayed silently, thinking, "God, if you want me to ask this question, you already made me get up here, so you have to make it happen. I'm not going to ask to move to the front of the line. It's up to you." I already knew which question I wanted to ask, and I knew that God was the one who'd put it in my mind, but I was terrified. My boss came up behind me and whispered, "Do you want to ask your question." I hesitated, but reluctantly nodded, "Yeah. I do." Just like that, I was moved to the front of the question-line. I introduced myself to another usher as I waited nervously. I tried not to rehearse what I was about to say since that strategy hadn't worked for me the first time. "Uhm, politically, I agree with you on everything. But, religiously, I'm a Christian. So, I was just wondering why you don't think Jesus is the Messiah?" "The reason I usually don't have these theological discussions is mainly that, in the words of a famous person, 'I find it divisive.'" He then went on to explain that the Jewish people are expecting a political figure, instead of God "in the flesh." 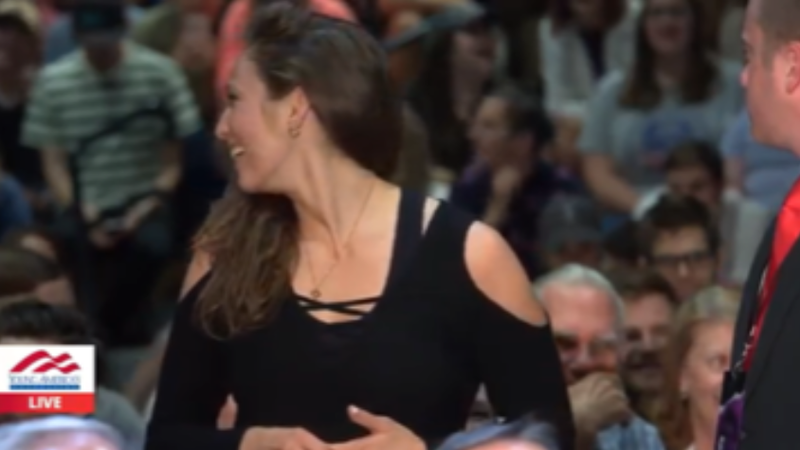 Although I normally love listening to these kinds of discussions, all I could focus on was the fact that my heart felt like it was going to beat out of my chest from resisting the urge to run from the sea of gawking people. After the event was over, Ben's bodyguard slipped him out of the gym almost noticeably as the rest of the YAF club cleaned up and took some last-minute pictures. 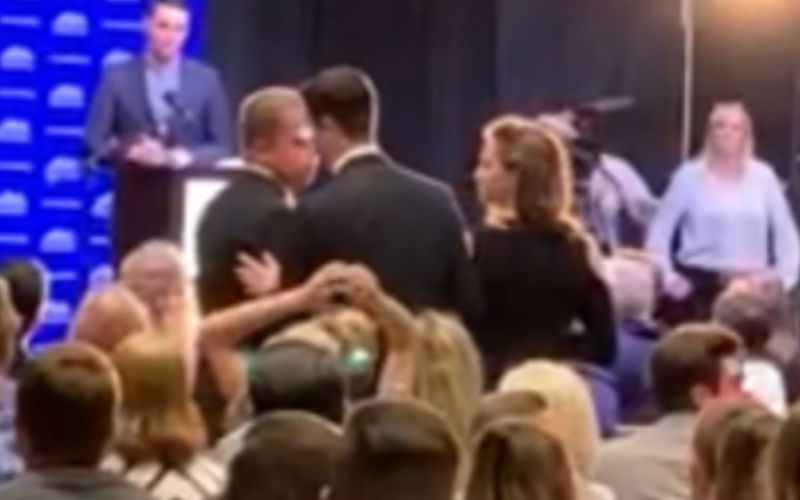 I couldn't stop shaking from the adrenaline rush of speaking in front of Ben Shapiro and a lot of people I either knew really well or had never seen before. Relief washed over me. Thank God my second conversation with Ben Shapiro was so much better than the first. They were both equally entertaining though.